Selling TVs on eBay - how does Australia compare with US and UK? Our recent post, regarding whether TVs have become a commodity or not, generated some follow up comments and questions. In particular, people wanted to know how eBay Australia compared with the US and UK. 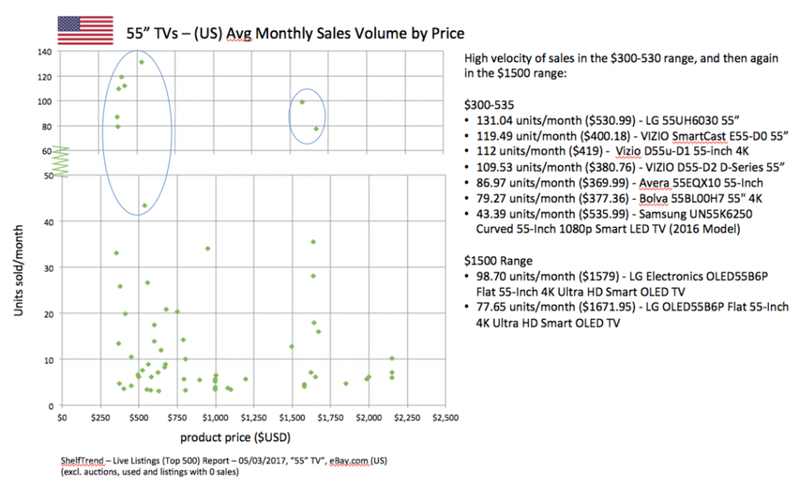 Here are our findings from ShelfTrend sales volume data for 55" TVs across those eBay markets. In the Australian market, the best seller is a $600AUD generic/tier 2 television followed by branded televisions between $800-$1300AUD. The Australian market is remarkably small in real numbers compared with the other countries. Nevertheless, eBay is a major player in the overall Australian retail landscape and an important option for Australian consumer seeking opportunist buying. In the US we see excellent velocity in the $300-$530USD price range. This lower priced segment largely comprises of generics. Sales quiet down substantially until it hits the $1500USD price range where clearly there are two LG models at $1579 and $1671.95 that are at great prices, attracting strong sales. In the UK, the leading price range is in the £300-400 range and it's all Techwood branded. Most other sales appear to be under 10 units a month which seems to imply a lack of competitively priced inventory that could drive more category interest and sales. Have a look at the charts below - it's an interesting comparative study. Please send your comments to us at contact@shelftrend.com. We'd love to hear your interpretation of the data or your insights. Older PostNoise-cancelling headphones on eBay.com, do premium brands dominate?